Create or edit questions on your registration form, including conditional questions! You can add as many Questions as you need. Just navigate to Questions->Add New. The Question Name is very important, as this is the main text that guests will see. 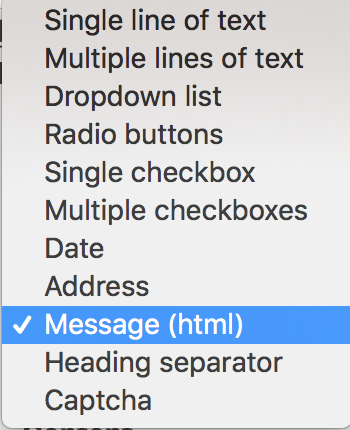 You can select many different types of Questions, simple text, checkboxes, drop down menus, messages, heading separators etc. Depending on the type of Question you select, different options will be displayed. For Question types like Radio Buttons, and Drop down, you will be allowed to enter multiple options for guests choose from. You can add helper text to assist the guests in answering the question. Note: Conditional Questions are not included in our base plans but can be added on as part of a package. Please check out our pricing page for details or contact us. You can create certain questions to only display on the registration form if a guest has answered another question a certain way. This is the display condition for conditional questions. Examples: if someone says they're a woman, you want to ask them if they're pregnant. Or if they have 5 extra minutes you want them to complete more detailed history of their yoga and meditation experience. When you select "show when a condition is met" then you'll be able to pick when this question you're setting up will show up on the registration form. You can then pick from a drop down of other, existing questions, and what answer would make this new question show up. Conditional questions only supports certain question types (Drop down list, radio buttons, single or multiple checkboxes). This means you can only create a conditional question based on these question types. Ie. you can't have a question show up based on how someone answers an open text field. But the new conditional question can be any input type! Don't forget to re-order your questions so the new conditional question shows up right after the main question. You can do this by dragging and dropping the questions on the main question page. You can set the context/location of the Question. Registration Specific - This means you can limit the Question to the Registration for information that is relevant to the Registration, and not the Person. For example, if you ask for a guests flight number, this question is most likely only specific to this single registration and not something you will want to be saved into the person database with their more permanent information. 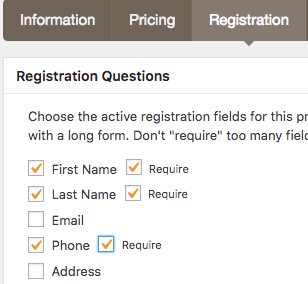 You will check this field to keep the question related only to the registration. Back-end admin - You can also set the Question to Back-end admin only, which means that the Questions will never be displayed on the Reg Form, and thus will only be available to Administrators. This is useful for adding private notes about a particular reservation or guest. Display only on guest-edit link (Secondary Forms) - This is a way for you to post-pone asking more detailed questions until after the guest has made a reservation. If checked, this question will be hidden on the Registration form, but will become visible using the "guest edit registration link". This means that you can send an email (even an automated email) to guests after they register for your program and request them to fill in a more detailed form. For more information on emailing this link to your guests, please see this article. Please note that if using the Back-end admin only option, than the Display only on guest-edit link option is not available. You can set the default status of the Question to be Enabled and/or Required by default. These settings will only be applied to newly created Programs. If you want to be able to filter Registrations and People by the Question, you can enable that here. You can enable custom permissions that will limit who can see this field. Note that Permissions are not available by default. Please contact us if you need them to be enabled. Once you save this Question, you will be able to enable it on your Programs. You can also return here at a alter date and edit the behaviour of the Question.